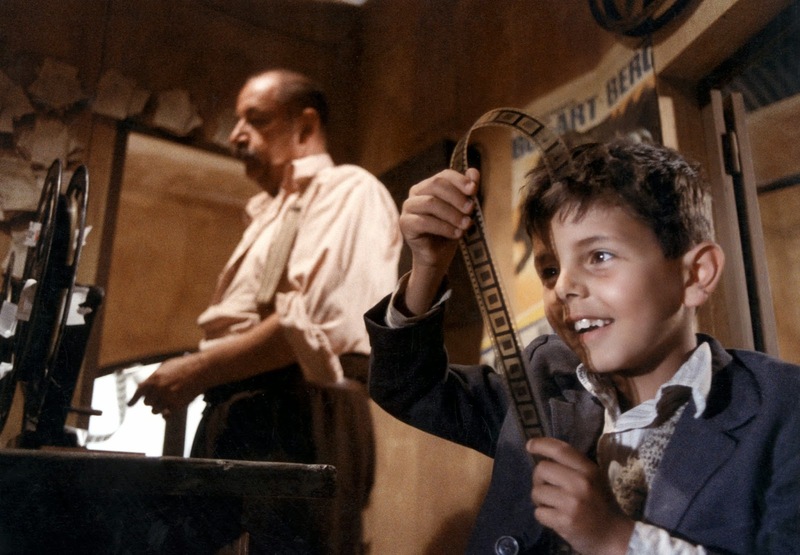 Cinema Paradiso is an apt name for a film about the type of heaven which can only be found at the movies. A romantic and loving feature, Giuseppe Tornatore’s film bursts with incredible passion and magnificently inspires the same warm emotions from those who meditate in its glow. 25 years on from it’s initial release, Cinema Paradiso has returned to cinemas in the heavily cut form which enchanted audiences and won plaudits aplenty a quarter of a century ago – it’s not difficult to see why the film is considered a classic, taking its place alongside the timeless Chaplin and Visconti movies which play in the film’s titular cinema theatre. So free is this film of cynicism, it would take the hardest or most jaded of hearts not to melt in its sumptuous visuals, honeysweet score by Ennio Morricone, and life-affirming tribute to the magic of moving images. Tornatore’s sentimental and nostalgic fantastical fable (told in flashbacks of woozy, idealised memories) concerns a post-war Sicilian cinema, the grumpy projectionist Alfredo (Phillip Noiret) who displays the latest movies for his community, and the young altar boy Toto (Salvatore Cascio) who yearns to understand the mysteries of the booth. Cinema is Toto’s first love and, like many inaugural romances, the one which comes to define him. Yet, as modernism creeps in to Sicilian life and Toto comes of an age where his passions begin to find outlets away from his confined projection booth, the cinema looks to sustain an uncertain future. Tornatore confronts us, with his ethereal and meta movie, with the question of why cinema is important and why, above all else, we must fight to sustain it. Although set in a very specific and vivid Italy of the past, those who have ever succumbed to the hushed reveries of the transcendental experiences of film will recognise the universal sentiment at Cinema Paradiso’s heart – the timelessness of movies and their ability to interconnect us all through what we share when we watch them. Observing Toto, both young and old, transported to the places only movies can reach, we the audience find ourselves watching the flickering lights of moving images through his eyes – Tornatore is using his film as an empathy machine, illustrating cinema at it’s most powerful, it’s most profound. As Toto’s eyes fill with images of kisses, his heart and mind, and ours too, suffuse with love. This is paradise. This is cinema.